Heat oven to 350°F. Spray bottom only of 9x5-inch loaf pan with cooking spray. In large bowl, stir bananas, sugar, egg product, milk, oil and vanilla until blended. Stir in Bisquick mix. Pour into pan. Bake 55 to 60 minutes or until toothpick inserted in center comes out clean. Cool 10 minutes. Run knife or metal spatula around sides of pan to loosen bread; remove from pan to cooling rack. Cool completely, about 1 hour 30 minutes, before slicing. The best bananas to use for baking have skins turning brown with black spots, and they are soft to the touch. 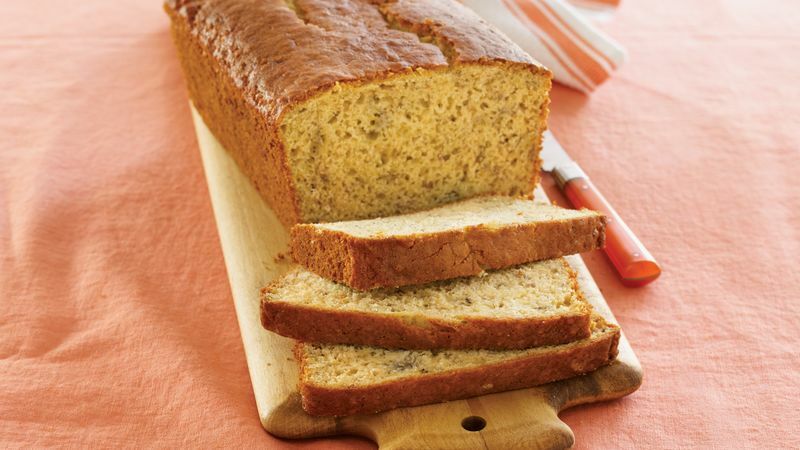 Overripe bananas can be put in the freezer, unpeeled, for later use. When you're ready to use them, just thaw them, cut off the top of the peel, and squeeze the banana into your measuring cup. Make sure to use a light touch when combining wet and dry ingredients. Stir just until moistened. Don’t worry about small lumps; they will disappear during baking. Overmixing will result in a dense, tough quick bread.